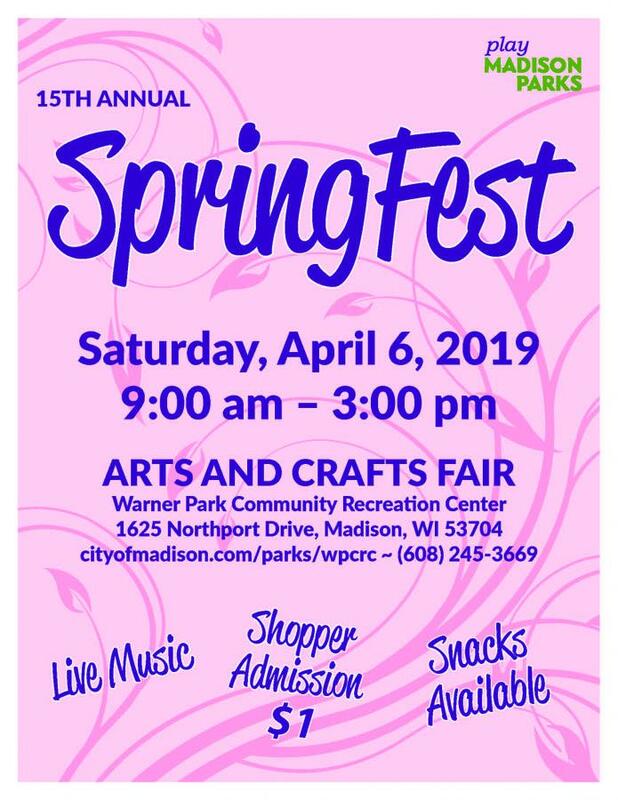 Join us for the annual SpringFest Arts & Crafts Fair held the first Saturday in April each year from 9 am-3 pm. Over 80 crafters from the Midwest will be selling their handmade goods. You can expect to see a variety of jewelry, baskets, garden art, cards, pottery, woodwork, baby gifts, soaps, balms, lotions, knitwear, paintings, home décor and more! It's the perfect place to find a unique gift for that special someone (or for yourself). WPCRC has two arts & crafts fairs each year. SpringFest is the first Saturday in April and HolidayFest is the first Saturday in December. All artists with handmade products are encouraged to apply (sales of commercial items, imports and novelties are not permitted). SpringFest vendor registration is open until filled. View the brochure for more details and an application form. Registration Details: Application Checklist • Include three (3) photos, even if done previously, of your craft or list a website where your work can be viewed? • Enclose payment for $65 plus $5 extra for electricity and $5 extra per table? Make checks payable to City Treasurer. • Please call 245-3669 to check for table/electricity availability. • Mail it to: WPCRC, 1625 Northport Dr., Madison, WI 53704. REGISTRATION OPEN UNTIL FILLED.